For the Universal Exhibition of 1889, the Eiffel Tower announces the twentieth century. 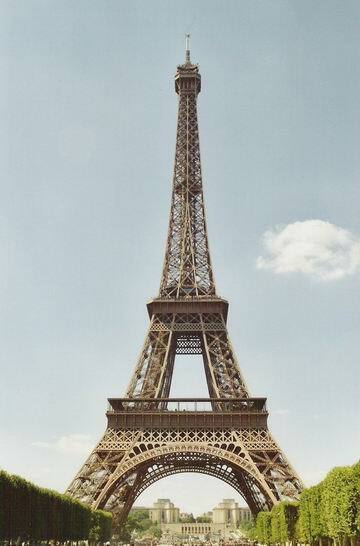 Having the ownership of the Tour for 20 years, its manufacturer founded in 1888 the Company of the Eiffel Tower. In 1909, the tower narrowly escaped being destroyed, and was saved by the radio (wireless telegraphy). In 1912, the tower gives time to the world, participates in national defense during the war, indicate the wind, air pressure, then, receives satellite TV. It now issues French channels. In the axis of the four cardinal points, four massive masonry of 26 m, for 9 to 14 meters deep are used to support the four legs of the Tour of 320 m.
The Eiffel Tower weighs 11 000 tons. The building was during the restoration campaign of 1984, reduced from 1 340 tons. It weighs 4kg/cm2 ground or ground pressure in cm2 of four legs of a chair on which sits an adult. It is painted every 7 years (the site takes 3 years), with three different colors shades from the lightest (top) to dark to accentuate the feeling of vertigo soil. 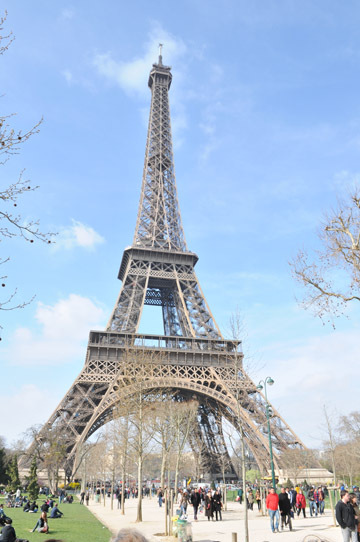 50 tons of paint are needed, the colors red and brown are due to iron oxide content in the paint, which contributes to the proper conservation of the iron tower. Each year, the three lifts travel 1003 000 kilometers (two and a half times around the earth). 1st floor: 57 m high: restaurant, bar, lounge. 2nd Floor: 115 m: restaurant, bar, tearoom. 3rd Floor: 214 m: location long views. Glance up to 90 KM from Paris on a clear day. The new flagship system and the flicker of the Tower every hour, were introduced at the « top 2000 », since December 31, 1999 at midnight Lighthouse, 2 light beams of a range of 80 kilometers. In Paris, Gustave Eiffel made the metal structures of the synagogue of the Rue des Tournelles, the church of Notre-Dame-des-Champs Boulevard Montparnasse, Saint-Joseph Saint-Maur, coverage of high school Boulevard Carnot Malesherbes, the Bon Marché, the cabaret Paradis Latin, the lobby of the Credit Lyonnais Boulevard des Italiens, which burned in 1997. The signature of the Eiffel company also appears on the facade of buildings scattered around the world. The Eiffel company is the designer of the steel structure of the Statue of Liberty Bartholdi, enthroned in the harbor of New York, built in 1878.